However, it was soon noticed that financial constraints would prohibit the line from being built in its entirety. So the section Praterstern-Stadlauer Brücke was instead added to line U1 as branch U1B; the section between Schottenring and Praterstern was abandoned altogether, and the remainder (Schottenring-Hernals) was to be operated as branch U4A of line U4. Line U5 had died for the first time. was referred to as U5 instead. However, these plans were also abandoned due to financial constraints. Thus line U5 had died a second time. At one point, line U5 appears as the designation for the tangential line Floridsdorf-Kagran-Stadlau on the other side of the river Danube (Network variant M, 1970); on all other plans this is, however, referred to as line U7, so the designation may just be an error. Thus there was no line U5 when the work began on preparing the first phase of the metro system. Only line U4A was left from the original plans. The plans to build lines U2 (Karlsplatz-Währing) and U4A (Schottenring-Hernals) in their entirety still existed, but it was clear that this could not be financed at this point. 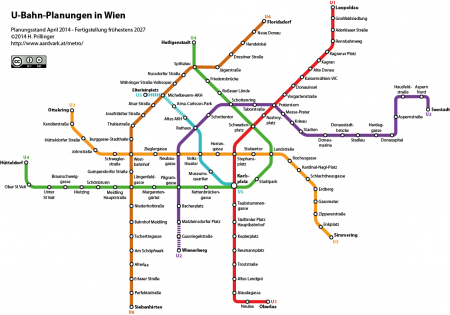 So the decision was made to build only parts of both lines and to simply link these at the Landesgericht by means of a very narrow curve (still the narrowest curve of the entire Vienna subway system), thus forming line U2 as it appears in the present network. In the early eighties the concept of branch lines was finally abandoned. However, the plans to build the sections to Währing and Hernals at some point in the future still existed, so line U4A was renamed back into U5. This had, however, no impact whatsoever as to the realisation of this line. In the early 1990s various politicians tried to increase their popularity by demanding that a "line U5" be built into the residential areas of Stadlau, Hirschstetten and Aspern. Suggestions included a line from Erdberg (U3/5) or an extension of line U2 (U2/5). City coucillor Görg finally adopted the idea and decided that the latter would indeed be built. The variant that was finally chosen from a number of suggestions turned out to be almost identical to that of line U5 of the 1960s! This means that line U2 actually consists of branches of the lines U2 and U5; U2 from Karlsplatz to Landesgericht, and U5 from Landesgericht to Stadlau. It was thus the ironic fate of line U5 to be built, but not to appear on the network map! In 2002, city councillor Schicker presented plans for stages 4 and 5 of the metro network, and stage 5 (to be built around 2020) again included a line U5. According to these plans, the current line U2 would indeed be split, but not as initially planned. Line U5 would go from Hernals to Landesgerichtsstrasse, but from then on not east, but south, where it was to take over the southern branch of line U2 to Gudrunstrasse via Karlsplatz, Eurogate, and the Arsenal. In turn, line U2 was to receive a completely new southern branch from Rathaus via Neubaugasse, Pilgramgasse and Matzleinsdorfer Platz to Wienerberg. These plans were shelved when Schicker was voted out of the city council. Ten years later, in 2014, line U5 reappeared and will now very likely be built until 2027. As in the 2002 plans, line U2 will be split and extended to Wienerberg, and a "new" line U5 will take over the branch from Karlsplatz to Rathaus, and from there via Frankhplatz, Arne-Carlsson-Park and Michelbeuern to Elterleinplatz. In how far the resulting line will improve the network is somewhat questionable. While it does complement the tramway network much better than previous projects and could provide some much-needed relief for the tramway lines in the 9th, 17th and 18th districts, its actual success is doubtful as passengers will lose time at the interchanges; what's worse, line U5 will only take them to Karlsplatz, where they will have to change trains again. Thus, it remains unclear whether line U5, when finally completed, will indeed be any more cost-effective than the previous projects.